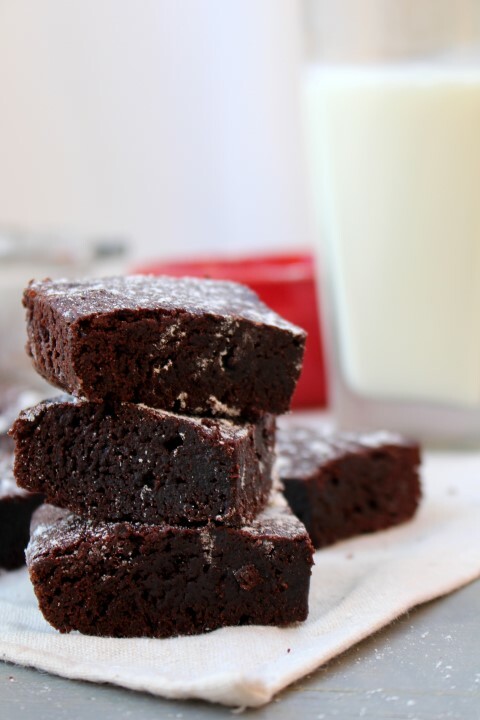 Everyone wants a box-mix style brownie, with their thick chewy texture and rich chocolate taste. Let’s face it. The texture is hard to duplicate from scratch at home. However, I have found a magic secret ingredient that will give these brownies the characteristic chewiness everyone desires. A simple tablespoon and a half of corn syrup will do the trick. I know, I know, corn syrup is the bane of a healthy diet, but who says brownies are healthy anyway. My theory is, if you’re going to splurge, you might as well have the best brownie you can possibly have. You can have a kale salad the next day to make up for it. The recipe is simple, both the ingredients and the technique. As I researched brownie recipes and techniques, I preferred to find a recipe that only uses cocoa and not a combination of cocoa and chocolate in a bar form. Most of the time the only form of chocolate that I have on hand is cocoa, and I don’t want to have to run to the grocery store to get bittersweet chocolate before I make brownies every time. I want a go-to recipe I can make in a pinch. The recipe presented below is a combination of several recipes and techniques I researched and tested. In addition to the magical corn syrup, the recipe also includes a bit of brown sugar which helps the texture and brings a richer taste to the chocolate making them my favorite brownie ever. What are your must have characteristics for brownies? Preheat oven to 325 F. Grease and flour a 9 x 9 baking pan. In a large glass bowl, melt the butter in the microwave. Stir in white sugar, brown sugar and corn syrup. Beat in eggs and vanilla. Gently stir in cocoa powder, salt and flour. Bake for 25 for 30 min or until a few crumb cling to an inserted toothpick. How did you know that fudgy brownies are my very favorite in the world?!! These look AH-mazing! Pinning to make ASAP! Thanks for the recipe! These look perfect. I love a thick fudgy brownie! I love a good chewy brownie. These look great! Brownies are an important part in my diet 🙂 These look delish! I’m sucker for brownies for sure! They look perfect. Pinning! 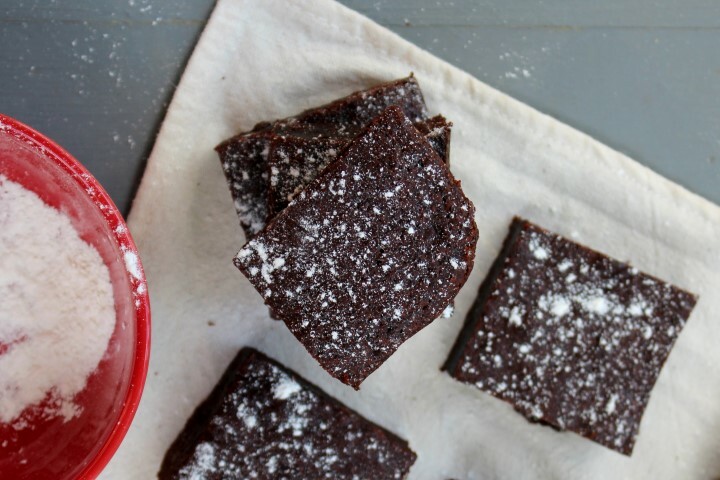 I prefer brownies with just cocoa powder in them also…this recipe looks like a keeper! You had me at Fudgy! 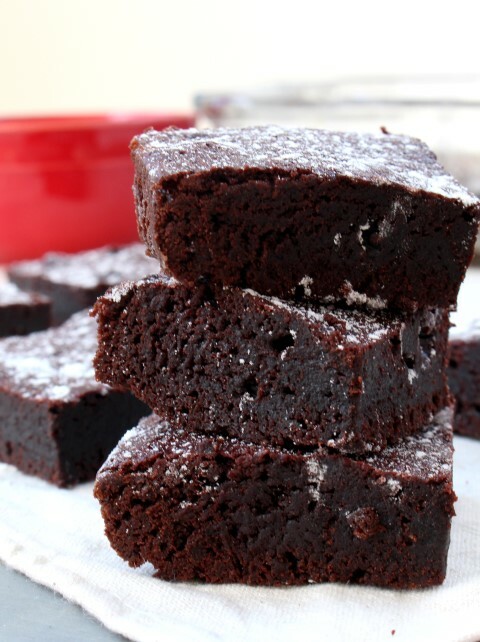 Fudgy brownies are the best and these look especially good! Thanks, Joelen. I agree with you 100%. Oh wow, these look fantastic!! I’ve never managed to make a brownie that I like as much as boxed mix brownies, so the description of these definitely caught my eye – yum! These look good but I’m double-checking… Is the oven temp really supposed to be 235? Wow. Thanks for checking. It should be 325 F. My typo. Fudgy brownies are the best, yum!! I agree! You can’t beat an awesome one! Hi- these look so good and want to make them but I’m out of butter. Can I sub margarine? I have never tried that, but it would probably work. 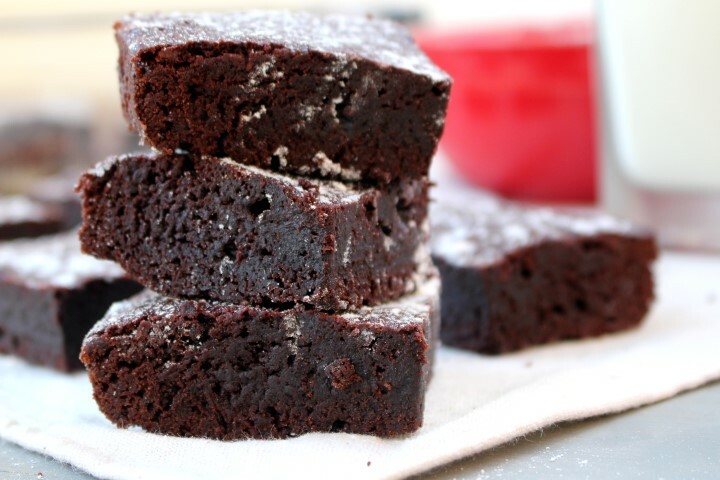 Thanks- I want to make these and I will try it out and let you know how it turn ok.
Mmmm, these thick fudgy brownies have my name written all over them!! 🙂 Do you deliver?? If only I could. I have a few too many sitting around my house. Thank you for the recipe! I don’t know where to buy corn syrup. What can I substitute the corn syrup with? Corn Syrup is commonly sold here in the US in the grocery store. I’m not sure what you could substitute for it. But you could leave it out entirely and the brownies would still turn out fine. They won’t be quite as chewy though. No joke, I just printed out this recipe – I’m going to a potluck dinner and I was told to bring dessert – these will be a crowd pleaser! Hi, I am newbie in baking and would like to try this recipe. What does 10T of butter stands for? Hi Lisa! 10 T stands for 10 tablespoons. Thanks for asking. I’m working on updating all my recipes to elimiate the abbreviations. Happy Baking!